You may recall, Amanda, our budget conscience bride looking for the perfect purple crystal bridesmaid jewelry sets to give as gifts to her bridal party. Amanda and Michael were married August 20, 2011. Congratulations to both!! Amanda was kind enough to send us a bridal photo of her special day with all her bridesmaids wearing their new custom designed bridesmaid jewelry sets. 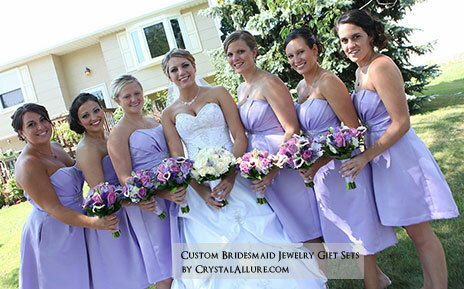 Each bridesmaid was gifted with a deep purple Custom Swarovski Crystal Bridesmaid Jewelry Set featuring a 3-tier crystal drop pendant on sterling silver necklace and coordinating crystal drop earrings. A simply elegant bridesmaid jewelry gift set for an elegant summer wedding in shades of lavender and purple. I also worked with Amanda's future Mother-in-Law, Mary Kay, and created a Custom Mother of the Groom Pearl Jewelry Set for her dress. Stephanie, Thank you so much for doing such a beautiful job on the jewelry for my bridesmaids. They looked gorgeous on my wedding day! Thank you!